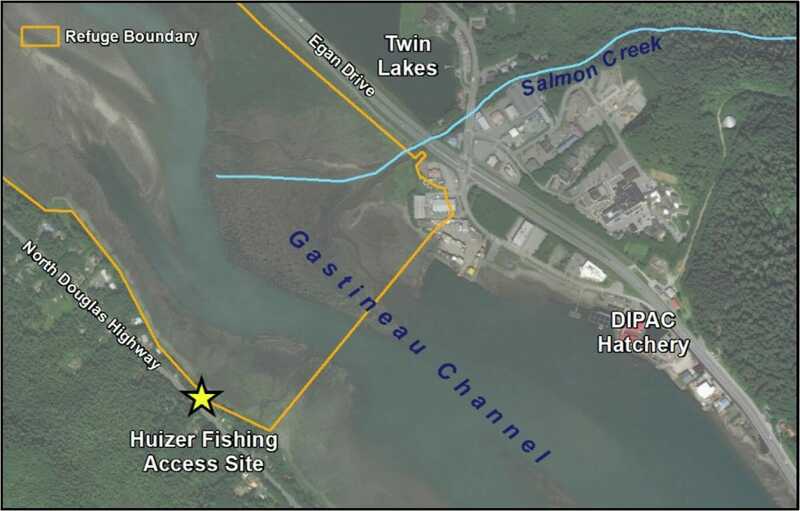 The Marjory and Edgar Huizer Fishing Access Site is located on Douglas Island, across the bridge from downtown Juneau. It provides public, year-round access to the Mendenhall Wetlands State Game Refuge. To get there, start at the bridge on Douglas Island and drive north for 2.7 miles. The parking area will be just past the well-known and highly visible “ski fence” on your right. Look for a gravel parking area and the stair access to the beach on the right side of the parking area. 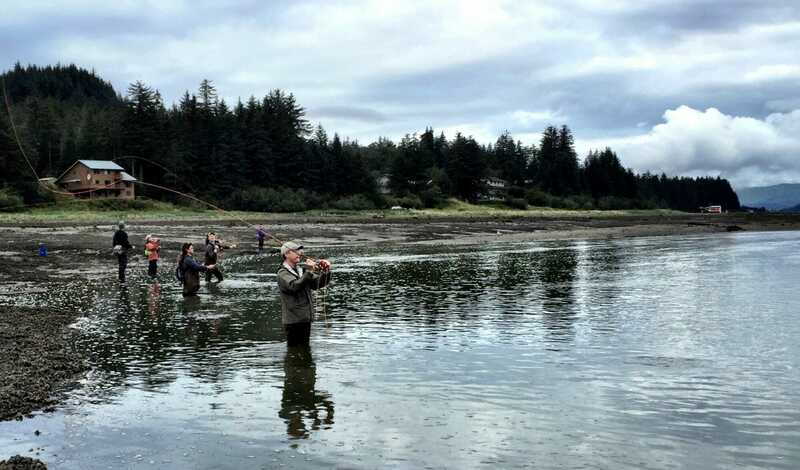 The Southeast Alaska Land Trust purchased this property with support from a major donor, Edgar J. Huizer, and in partnership with the Department of Alaska Fish and Game, Division of Sport Fish, on March 30, 2015. We did this to improve the quality of life in Juneau by providing a new public access point to Gastineau Channel and the Mendenhall Wetlands State Game Refuge for recreation, scenic views, and to provide an ecological buffer for the protected 3,800-acre Mendenhall Wetlands State Game Refuge. 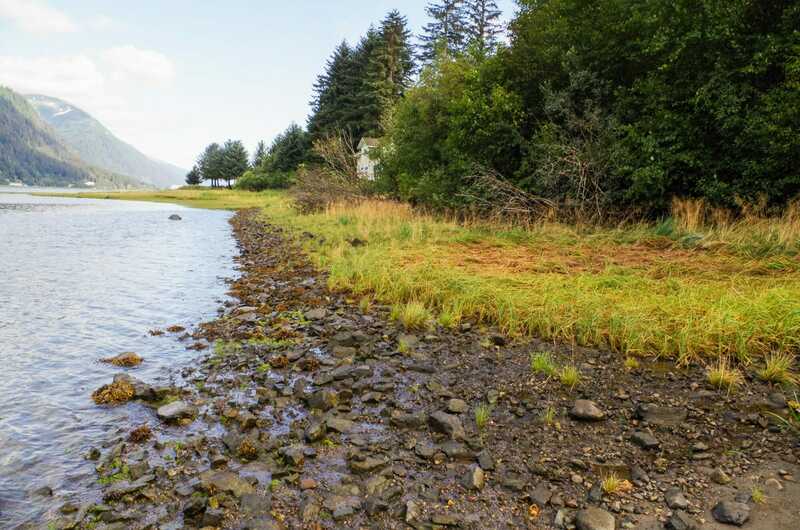 The property is named in honor of the major donors – Marjory and Edgar Huizer – two well-known Juneau locals who were passionate about conservation and recreation. 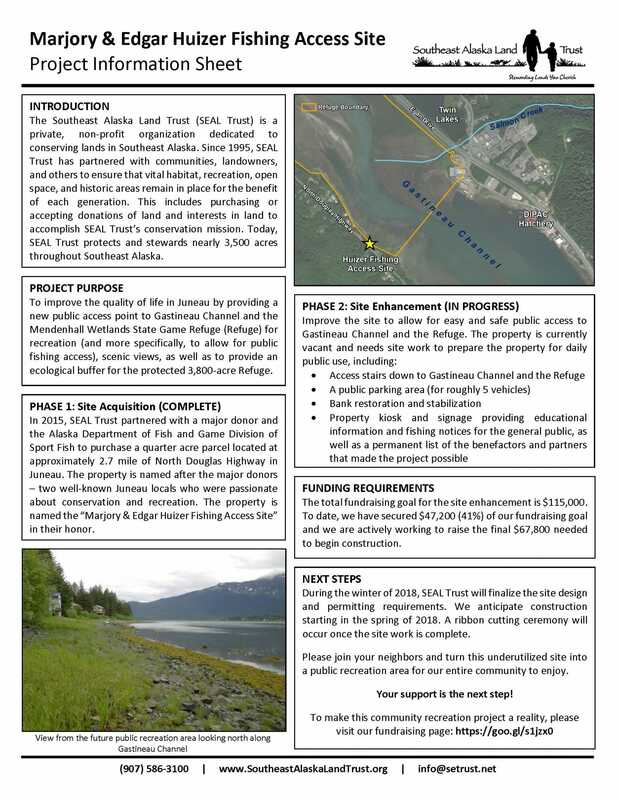 The Southeast Alaska Land Trust is currently fundraising in order to improve this site to allow for easy and safe public access to Gastineau Channel and the Mendenhall Wetlands State Game Refuge. The site is a coastal/waterfront property that abuts the Mendenhall Wetlands State Game Refuge and expands upon an existing protected area. Provides important upland buffer that helps to preserve the integrity of the ecologically important habitat contained within the Refuge. Provides public access to the Mendenhall Wetlands State Game refuge and Gastineau Channel for use by fishermen and the general public. The property is strategically located directly across the Channel from the DIPAC Macaulay Salmon Hatchery. The protection of this property ensures that the recreational, scientific, and educational opportunities of the Mendenhall Wetlands State Game Refuge remain accessible forever. Opportunity for general public to use the property or appreciate its undeveloped, scenic values. We are still fundraising to cover the costs of the new stairs, informational signs, and convenient parking. Won’t you help? For a printable version of this document, please go to this link.